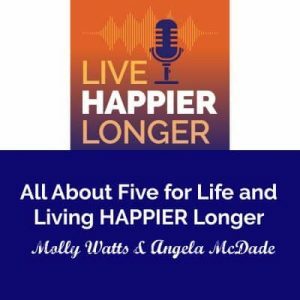 In the first Live HAPPIER Longer podcast, Molly and Angela discuss how Five for Life came to be, just over a year ago. For Molly, watching her parents age very differently helped her recognize what path she wanted to take; one that allowed her to live longer and happier. She realized that it would require habits to be built in mid-life that would continue as she aged. Five for Life presents five daily actions we can all take to help us achieve that goal! Every single one of the five daily actions are backed by science to increase longevity and improve the overall quality of your life. The daily planner will offer you opportunities to write daily and help you be more productive. The Five for Life Planner comes out in time for the 2018 holidays. You don’t have to wait to have a longer better life, it starts right now.